Understanding the cosmic star formation history is important for constraining galaxy formation models. Multi-wavelength studies revealed that the cosmic star formation rate gradually rises by one order of magnitude from the present-day to redshift z=2 (~10 Gyr ago). However, at z>2, the contribution from the dusty star-forming galaxy population is still uncertain, and searching for the first galaxies that emerged from the cosmic "dark ages" at z>7 is a major observational challenge. ALMA traces the redshifted emission from near and beyond the peak of the dust emission. For high-z sources, negative k-correction overcomes the effect of the inverse square law and surface brightness dimming, making ALMA observations nearly independent of redshift for z ~ 0.5 – 10 (see Figure 1.1). In addition to the submm bright population, ALMA targets fainter, more normal (Milky Way type) galaxies selected through optical surveys (e.g., Lyman-break galaxies - LBGs; Lyman-alpha emitters - LAEs). The observed continuum emission can be used to trace the dust mass and temperature, the dusty star formation activity, and also the mass of the interstellar medium (ISM). Because of its capability to make extremely deep, high-resolution images of high-redshift galaxies, ALMA is an excellent and unique instrument for observing submillimeter galaxies (SMGs), for studying gravitational lensing, and for resolving the mm / submm extragalactic background light, which likely originates from fainter normal galaxies. Figure 1.1: The predicted flux density of a dusty galaxy as a function of redshift in various submm / mm atmospheric windows (Blain et al. 2002). In addition to studies of the dust continuum emission, ALMA’s strength is in its capability to detect and image line emission from molecular and atomic gas, which are important tracers of the cold and warm components in distant galaxies. The cold gas component is thought to be the constituents for new stars, but its distribution and properties are likely regulated by the complex interplay between accretion (e.g., from major/minor mergers and cold mode accretion) and mass loss (e.g., from stellar/AGN outflows). Another advantage for ALMA, because of its superb sensitivity, is to determine the redshifts of dusty starburst galaxies by detecting one or more emission lines in the ALMA bands. The far-infrared atomic lines are tracers of the neutral/ionized medium, and they are redshifted to the ALMA bands. Singly ionized carbon ([CII] at 158 micron) is thought to be the dominant coolant in the ISM and the strongest fine structure line from galaxies. The [CI] line arises from similar regions as the CO emission. Other notable lines are [NII], [OI] and [OIII]; the ratios of these fine structure lines can be used to diagnose the strength of the radiation field or metallicity. This allows us to study very high-z sources from the reionization epoch, possibly enabling us to study the first galaxies. ALMA can observe the CO emission from galaxies with nearly continuous coverage in redshift. While the lowest-J CO line is redshifted out of ALMA Band 3 for z>0.37, higher-J rotational CO lines, which trace the the warm/dense gas directly associated with star-formation/AGN activity, are observable across a large redshift range. The very high-J rotational CO lines, observed with the Herschel satellite in nearby sources, can be observed with ALMA for high redshift galaxies. Examples of the science that can be carried out using these lines are: (1) the distribution and kinematics of the molecular emission, (2) molecular excitation, (3) gas/dynamical mass, (4) inflow/outflow, (5) properties of star formation, and (6) metallicity. Other notable molecular lines include dense gas tracers HCN, HCO+, the shock tracer SiO, optically thin 13CO, and H2O, just to name a few. Figure 1.2: Redshifted frequencies of molecular and atomic lines observable in the ALMA bands. The filled circles correspond to lines detected at the time of publication. Figure from Carilli & Walter (2013). A number of SMG surveys have been carried out with ALMA. For example, Karim et al. (2013) observed 122 submm sources selected from the LABOCA Extended Chandra Deep Field South Submillimeter Survey (LESS) using ALMA (see Figure 1.3). With 1.5” resolution, they pinpointed the SMGs contributing the submillimeter emission in the LABOCA map, showing that the brightest sources in the original LESS sample comprise emission from multiple fainter SMGs. They also serendipitously detected bright emission lines in two of the SMG spectra which are likely [CII] 158 micron emission at z=4.42 and z=4.44, demonstrating that ALMA can detect the dominant fine-structure cooling lines from SMGs even with short (2 min) integrations. Dunlop et al. (2017; see Figure 1.4) conducted a deep cosmology submillimeter continuum survey of the Hubble Ultra Deep Field and detected 16 sources with an average redshift of <z>=2.15. They find that 85% of the total star formation at z=2 is enshrouded in dust. The ALMA SPECtroscopic Survey in the Hubble Ultra-Deep Field (ASPECS) is designed to obtain an unbiased census of gas and dust continuum in high redshift galaxies. Initial results are presented in Walter et al. (2016), and an ALMA Cycle 4 Large Program led by F. Walter, C. Carilli, and M. Aravena will expand the coverage and depth of the survey. 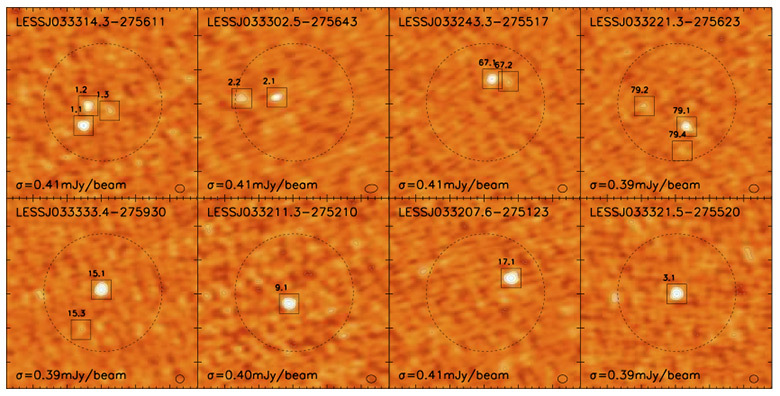 Figure 1.3 – ALMA Band 7 observations reveal that the brightest submm sources (S870μm>12mJy) in the LESS survey comprise multiple, fainter galaxies. Figure from Karim et al. (2013). Figure 1.4: The ALMA 1.3-mm map of the Hubble Ultra Deep Field (HUDF). Figure from Dunlop et al. (2017). Vieira et al. (2013; see Figure 1.5) used ALMA to observe strongly gravitationally lensed sources detected originally with the South Pole Telescope (SPT). They find that the sources are composed of multiple components, indicative of gravitational lensing. Their gravitational lensing model suggests that the sources are amplified by factors of 4 – 22, which suggests that the lensed sources are ultraluminous starburst galaxies at high redshift. Their blind redshift search in Band 3 resulted in line detections in 23 sources with 44 line features in the spectra, providing secure redshifts for ~70% of the sample. Their new analysis gave a mean redshift of z=3.5, and found that a significant portion of SMGs are indeed at high-z (z>4). These new findings will impact our current understanding of the formation of massive galaxies at high-z. Spilker et al. 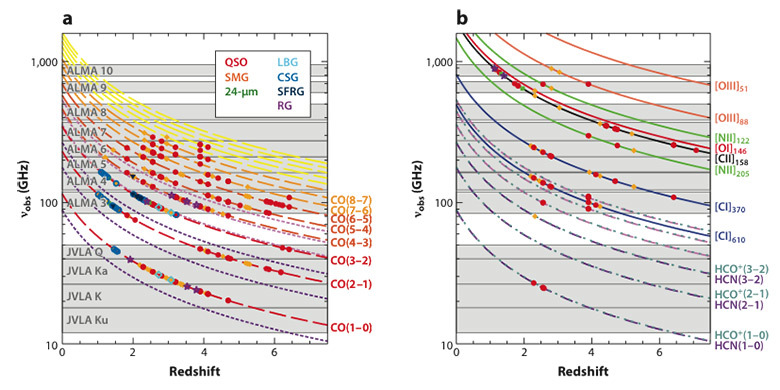 (2014) analyzed the stacked spectrum of 22 SPT sources from 250 to 770 GHz, and detected spectral features of 12CO, 13CO, HCN, HNC, HCO+, [CI], H2O. Figure 1.5: ALMA Band 3 redshift survey of 26 lensed galaxies selected from the South Pole Telescope (SPT) SZ survey. Reprinted by permission from Macmillan Publishers Ltd: Nature, (Vieira et al. 2013, vol 495, Issue 7441, p. 344). Using Band 6, Nagao et al. (2012) observed a z=4.8 SMG selected from the LESS survey. They detected the [NII] 205 micron emission line and assessed the metallicity of the SMG from the [NII] 205 micron and [CII] 158 micron flux ratio. They find that the metallicity in the SMG is consistent with solar, implying that the chemical evolution has progressed very rapidly in high-z SMGs. A z=5.3 SMG called AzTEC-3 was observed in the [CII] and OH lines by Riechers et al. (2014). Their spatially resolved image allowed them to derive the surface density of the star formation rate, and they find that it is comparable to the Eddington limit for radiation pressure supported disks. In addition to AzTEC-3, they detected the [CII] line in three Lyman Break Galaxies (LBGs) that are clustered around AzTEC-3 (see Figure 1.6). These measurements show that ALMA can detect the ISM in “typical” galaxies in the early universe. Figure 1.6: Left: ALMA [CII] image (contours) overlaid on HST optical image toward the z = 5.3 submillimeter galaxy AzTEC-3. Strong [CII] emission is detected toward AzTEC-3 distributed over a scale of 3.9 kpc. Right: ALMA [CII] image toward three Lyman Break Galaxies that are part of the galaxy protocluster associated with AzTEC-3. The [CII] emission is distributed over 7.5 kpc. Figure from Riechers et al. (2014). Hatsukade et al. (2013) serendipitously detected 15 faint "sub-mJy sources" in Band 6 data targeting 20 star-forming galaxies at z~1.4. They obtained source number counts at the faintest flux range among surveys at millimeter wavelengths, suggesting that ~80% of the extragalactic background light at mm /submm wavelengths come from such fainter galaxies. A similar result was obtained by Ono et al. (2014). More recent studies by Carniani et al. (2015) and Fujimoto et al. (2016) with improved statistics have shown that almost all of the extragalactic background light can be explained by galaxies. Figure 1.7: Differential galaxy number counts at 1.2mm. Figure from Fujimoto et al. (2016). Discovered by the Herschel Space Observatory with a redshift first measured by the Green Bank Telescope, SDP.81 is an active star-forming galaxy at z=3.042, seen at a time when the Universe was only 15 percent of its current age. It is being lensed by a massive foreground galaxy at z = 0.299. ALMA observed this lensing system with 0.023” resolution, corresponding to an unmagnified spatial scale of 180 pc (ALMA Partnership et al. 2015; see Figure 1.8). Subtle distortions in the ALMA image of SDP.81, generated by the gravitational influence of dark matter, reveal a dwarf disk galaxy within the halo of the much larger lensing galaxy. The location of the dwarf may be pinpointed by sophisticated lens models; its nearness to the large galaxy, its estimated mass and its lack of an optical counterpart all suggest a dwarf dark-matter dominated disk galaxy causes the gravitational distortion (Hezaveh et al 2016). ALMA’s precision imaging capabilities may lead to further discoveries of hidden dark galaxies. Figure 1.8: ALMA/Hubble composite image of the gravitationally lensed galaxy SDP.81. The bright orange central region of the ring reveals the glowing dust in this distant galaxy. The surrounding lower-resolution portions of the ring trace the millimeter wavelength light emitted by carbon monoxide. The diffuse blue element at the center of the ring is from the intervening lensing galaxy, as seen with the Hubble Space Telescope. Credit: ALMA (NRAO/ESO/NAOJ); B. Saxton NRAO/AUI/NSF; NASA/ESA Hubble, T. Hunter (NRAO). Hezaveh et al. 2016, ApJ, 823, 37. Wang et al. (2013) and Willott et al. (2013) observed z=5.8-6.4 QSOs using Band 6 and 7 of ALMA. They estimated the dynamical masses of the QSO host galaxies using the [CII] 158 micron emission line. They find that the dynamical masses are significantly lower than expected from the local black hole - velocity dispersion (or bulge mass) correlation, suggesting that stellar mass growth lags black hole growth for high-z QSOs. A number of ALMA observations were aimed towards detecting gas and dust in the earliest galaxies in the universe. Capak et al. (2015; see Figure 1.9) searched for continuum and [CII] measurements toward a sample of 10 galaxies at redshift of z=5-6. They found an enhanced carbon to continuum ratio compared to lower redshift galaxies, indicating a strong evolution in the ISM properties in the early universe in that galaxies at z=5-6 have significantly less dust than galaxies at z<3. 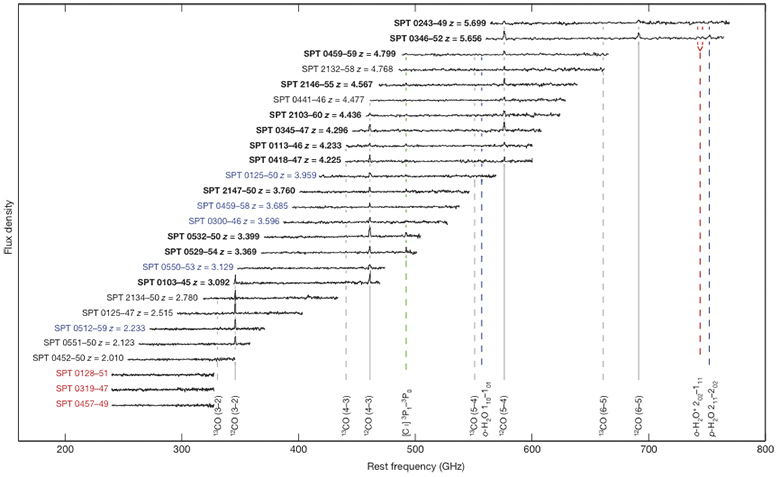 Figure 1.9: ALMA spectra toward 10 galaxies at redshift z=5-6. All sources but HZ5 have been detected in C[II]. Figure from Capak et al. (2015). Groups and clusters of galaxies are among the most massive gravitationally-bound objects in the Universe, and their distribution and evolution is sensitive to cosmology. Roughly 15% of their mass is in the form of a hot (> 107 K) component, with the rest being made up by dark matter (~80%) and stellar content (~3-5%). Though the hot gas content, known as the intracluster medium (ICM), is traditionally studied through X-ray observations, ALMA’s mm/submm observations offer a complementary and redshift-independent probe of this same gas through the Sunyaev-Zeldovich (SZ) effect. The SZ effect is sensitive to the line of sight integral of electron pressure, and uniquely manifests as a flux decrement at frequencies < 218 GHz. At low resolution (1-10 arcminutes), the SZ effect has been used to survey the sky for galaxy clusters by such telescopes as Planck, the South Pole Telescope, and the Atacama Cosmology Telescope, finding clusters out to z~2. At the resolutions accessible to ALMA, Kitayama et al. (2016; see Figure 1.10) and Basu et al. (2016) have used the SZ to probe cluster astrophysics, opening a new window on ICM physics at high redshift in a fraction of the time required for X-ray observations (typically 100’s of kiloseconds). Figure 1.10: SZ map of RXJ1347.5-1145 obtained at 92 GHz of ALMA. The positions of the SZE peak and the subtracted central AGN are marked by a cross and a diamond. Figure from Kitayama et al. (2016).